This is a Yummy appetizer that is easy to prepare, healthy for you and makes a wonderful presentation for Holiday Entertaining and it is one of my favorites! Mix the dry onion soup with the fat free sour cream in a mixing bowl to make onion dip and set aside. Sauté in a medium frying pan in the olive oil and garlic over medium/low heat for 3 to 5 minutes. Slice the Baguette into ½ inch rounds and spread with the onion dip. 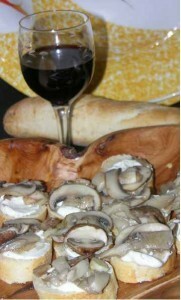 Using a pair of tongs top each bread slice w/ onion dip with a few of the sautéed mushrooms and serve hot.